Long-arm quilting machines are the passionate quilter’s dream machine! While they’re too expensive and space-consuming for us to recommend to most quilters, no traditional quilting machine can give you the speed, power, and workspace that one of these can. In this guide, we’ll examine the pros and cons of working with a long-arm quilting machine, and introduce you to the models we think are the best on the market. We’ve written in-depth, comprehensive reviews for each of our favorites. Then, in our buying guide, we’ll help you decide which (if any) is the right choice for you! The Juki TL-2000QI is our least expensive recommendation for a long-arm quilting machine. It’s also our recommendation to the vast majority of buyers. We think this package offers a tremendous value and a degree of functionality that should satisfy even demanding users. We recommend it in place of the older Tin Lizzie machine we used to recommend in this slot. It offers a lot of the same rugged performance for a similarly low price. In this package, it’s paired with Gracie’s King frame. It’s a fantastic machine for the price. At this price, we don’t think you can find anything more rugged, accurate, or powerful. That’s not even getting into the Juki’s user-friendliness and ergonomic chops. We think it’s an absolute bargain. Unless you really use and demand the bells and whistles a computerised machine offers, the Juki has everything you need from a long-arm system. Stitch control makes it feel super up-to-date even though it doesn’t have a computer, and it’s as accurate as anything but the ultra premium models below. Simplicity has all sorts of benefits, from making the Juki easy to maintain to making it refreshingly easy to get up and running. The machine includes clear, thorough instructions and a DVD. There are also lots of tutorials and walkthroughs on Youtube. It comes with an excellent frame, too! At this price, most frames you’ll find are cheap and rickety. This one is rock-solid and steady–something you’ll really enjoy using. It’s basic compared to the more expensive quilting models we’ve recommended below. There’s no computer, and a decided lack of bells and whistles. While simplicity will be very appealing to some folks, others will be better suited to the premium models with more features below. Even the cheapest long-arm quilting machines aren’t exactly cheap! We think this is the least you can pay for a solid, capable machine that won’t let you down. Just be aware that it’s not the least expensive on the market today. The Q’nique is our premium recommendation for quilters looking for a model to stand at. 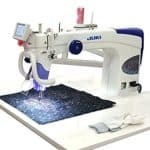 It’s a full-size long-arm quilting machine that comes with a frame so that you can hang your entire workpiece as you go–just like the Juki above, only with a lot more bells and whistles! Unlike the Juki the Q’nique has an onboard computer and all the advantages that provides. Its OLED screen is bright and legible. It displays sewing settings for your current project, as well as a user-friendly menu system. It has stitch regulation built in, so you can lean a bit on the computer instead of relying completely on your own instincts and skills. The regulator keeps stitches consistent as you change speeds! It produces extremely neat, even stitches–just like the Juki. The first mode is “Precise”, and it’s the setting that kicks in your stitch regulation. It makes sure you get exact stitches per inch no matter how quickly you move along the quilt. It’ll also stop stitching when you stop moving the machine along. The “Cruise” mode keeps the stitches per inch setting, and also adds a minimum stitch speed. It works in much the same way, always keeping your stitches consistent, but it lets you stop or slow your movement without stopping or going below the minimum stitch speed you’ve set. The “Baste” mode is exactly what you’d expect. It’s for doing long basting stitches around your quilt’s edges. There are three stitch length options, and that’s that! It’s simple but convenient. Finally, the “Manual” model puts you in charge of everything. You’ll control the stitch speed via the buttons on the handles, and the speed will remain constant no matter how fast or slow you move. It’s ideal for any sections where you want to make intricate patterns or fine details without being hampered by a computer system that thinks it knows best! It places a big premium on ergonomics. You can see all the settings on the front of the machine at a glance, and all the adjustments are front-facing and located right on the handles. The comfort grip handles are a pleasure to use, too. We love how many of the controls have dedicated buttons right on the grips! Other buttons on the handles allow you to adjust your stitching speed via up and down buttons. If you enable the stitch regulation mode, they’ll also control your stitch length! That’s done by adjusting the speed to ensure consistent stitches once you’ve set the stitches per inch you want. It works up to the the machine’s maximum speed, and can adjust automatically to your movements. There’s also a very well thought-out feature that allows you to swap the control alignments for either right or left-handed configurations! Like the Juki, the Q’nique can wind bobbins as you work. It’ll also wind without the machine running, which is a great feature! You can stock up beforehand. It has an easy-access bobbin mechanism which is infinitely more convenient than the Tin Lizzie’s. The Q’nique’s is much more modern and ergonomic, even if this isn’t a make-or-break feature. This one has dual-cone thread towers like the Juki. LED worklights are included, and they do a good job covering your main work area. It’s very expandable! The Q’nique is something that you can build off of as you go along. If you like to use different accessories, this one’s much more up your alley. The Q’nique Quilting Frame is a carriage and track, dual-wheel system which makes for a super smooth experience. It comes with bungee clamps for the frame so that you can get perfect side tension for your quilts. It’s also adjustable to fit quilts from king to crib sizes, so you can tweak your frame for each specific project! This system is compatible with the company’s QuiltMotion/Creative Touch software packages. If you want to be able to plan out your quilt projects digitally, you can do so on tablets or PC’s (Windows only). The software is elaborate, but it’s relatively easy to use and has a massive pattern library to work with. It lets you make pantographs, add texts and fonts, and virtual patterns. You can even trace photographs and save the traced lines as stitch patterns! The machine will do all the hard work to achieve your planned design for you! It comes with spare bobbins, needles, and ditties. It’s harder to set up than the Juki. Some people had issues with the tensioning system. The Grace company (Q’nique’s parent) has great troubleshooting support, but it’s still a bit of a process to get up and running. Even though it has lots of conveniences and amenities, thread-cutting isn’t one of them. Since you have to use it with the frame, it takes up a lot of space. The frame takes up 126” at its longest setting, so be sure to measure your space before buying. Unless you have a dedicated crafting room, this one might be hard to find room for. This is a complete package, despite the fact that it doesn’t come with an extended frame. You get a sit-down, long-arm quilting machine plus a table with extension leaf. The standard table has a 35” width, plus the leaf (which adds another 2 feet). The table’s height is adjustable between 30” and 34”, so you’re sure to find something comfortable. The table is adjustable and folds down for storage and transport. As with the cheaper model, the table is all-metal. It’s sturdy and very user-friendly to set up and take down. You can add another leaf if you want even more space! It has just as much throat space as the other Juki, at 18”. That’s the kind of workspace you should expect at this price! It puts the Q’nique to shame. Where the Juki really seals the deal is the height clearance: 10”. That’s lots of maneuvering space for you, and it’s hard to express how much nicer it is to have the arm so far out of the way! It’s a lot slimmer overall than the other sit-down models on the market. The internal direct-drive motor is also super quiet. So, the whole thing is unobtrusive in a way that the industrial Tin Lizzie doesn’t quite match. It’s the fastest of the three! You can sew up to 2200 stitches per minute on the Juki, which is absurdly fast. There’s no way anybody would describe this as laggardly. We think it’s at least as fast as any quilter could work, so even if you’re planning to get faster over time, you won’t be outgrowing this machine–ever. It also gives you complete stitch control, much like the Q’nique’s system. It’s all managed by the smart computer system. It has a big, bright LCD touchscreen display that shows you needle position, stitching speed, and more. It’s fairly similar to the Q’nique’s computer, except it’s not as easy to hook up to a tablet or other software. It has bright LED worklights, also similar to the Q’nique’s. It has the same oversized M-class bobbins too, plus an independent bobbin winder. It works like the Q’nique’s, in that bobbins can be wound both when the machine is stitching and when it’s idle. The bobbin case is enlarged, and the latch is redesigned to be user-friendly. It’s certainly easier to use than the Tin Lizzie’s, if not as painless as the Q’nique’s. There are buttons to move the needle up and down, albeit located on the machine instead of on the handles as you’d find on the Q’nique. That’s the downside of having something designed to work in both sit-down and standing configurations–you end up with more of the controls on the machine. There’s also a manual knob to move the needle yourself when the machine is off. It’s a nice backup that the Q’nique doesn’t feature. It’s the only one of the three that has an automatic thread trimmer! This one’s actually the only one on the market right now with that feature. While it may seem like an unimportant extra, it can be surprisingly efficient over a long project. You’ll find you save lots of time, especially since you don’t need to worry about knotting off your threads. The machine does it all for you! You can also cut threads manually whenever you want, with a dedicated button on the touchscreen. It has the best build quality of the three. The Juki is made entirely in Japan, by a brand that has an absolutely stellar reputation for quality and quality control. It’s a dry-head system, which means there’s no lubrication to worry about. That makes this the least high-maintenance of the three! You can technically convert it to a standing format with an additional Juki frame. That makes the cost close to $10K, which is why we haven’t recommended the standing package here. However, if budget isn’t an issue and you prefer to stand, the option is there. Like the Q’nique, it’s expandable with several accessory ports. Sit-down quilting machines aren’t for everyone. You should be absolutely sure that you want one before you make the purchase. 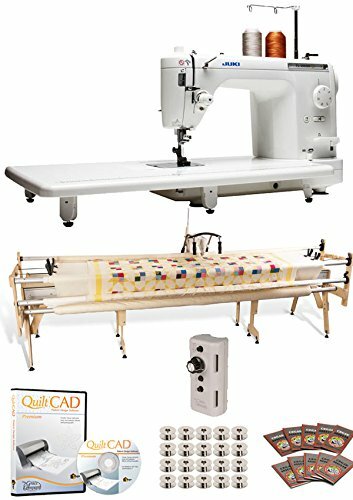 Which of these long-arm quilting machines is the best choice for you? The Juki TL-2000QI is the best choice for anyone on a budget. It’s powerful, fast, accurate and reliable. Plus, this one comes with an excellent frame for the price of most standalone machines. Unless you really want a computerised model and are prepared to pay a premium for one, there’s no reason to spend more for the Gracie. The Gracie is our recommendation to those who want the gold standard in long-arm quilting machines. We don’t think the Gracie is essential for most quilters, but passionate folks will really appreciate what an outstanding setup it offers. Finally, we recommend the Juki TL2200QVP-S as an alternative for passionate quilters who like to work in a seated position. This one’s extremely expensive but it’s ludicrously good and ought to last practically forever. We recommend it to anyone who knows they’ll get their money’s worth out of it. As you’ll know by now, long-arm quilting machines are massive investments. You want to make sure you’re getting your ideal machine before you buy, because these aren’t exactly easy to return. There are two main formats you’ll find long-arm quilting machines in. Some models are configured as sit-down machines that you’d use on a table with a chair. In this setup, the machine stays in place, and you move the quilt around the worktop. Sit-down models tend to be the cheapest, mostly because a table costs less to make than an elaborate quilting stand. They’re the best choice for folks with bad backs or leg pain, too. Other long-arm machines are configured for standing use. They’re mounted on long stands, which have rollers which you use to set your quilt up. Standing models usually move along a track stretching the length of the stand, which allows you to sew across your quilt. The rollers also make it easy to move your quilt around as you work. These are generally the best choices for very large quilts, and for elaborate patterns. The very best long-arm quilting machines are designed to work in either format. However, conversion kits are very pricey, and often cost several thousand dollars on top of the cost of the machine. So, we think it makes sense to know what you want up front, and avoid having to pay to convert your machine later. Considering your budget when you’re in the market for a long-arm quilting machine is no small thing. These machines are exponentially pricier than your typical home sewing machine, so prepare your wallet! You should be prepared to spend $2500 minimum for a decent manual, sit-down model, and as much as $10K for a top-notch, computerized, standing model. With such a big investment, you need to be honest with yourself about whether or not one of these machines is really justifiable. If you quilt daily and are ambitious with your output, you could probably justify one. However, unless you compete with your quilts or make money from selling them, $10K is an exorbitant amount to spend. Don’t buy one of those models unless cost isn’t an issue for you. In that case, go to town! Think about how much use you’ll get out of your machine, the caliber of quilt you want to put put, and how much money you can afford to invest right now. Most of these models are available with financing plans as well, as is common for such a large item. As with any quilting machine, you should look for something that gives you lots of room to work! Here, that matter of choosing between the sit-down and standing formats becomes super important. In general, standing long-arm quilting models give you the most room to spread your quilts out. That’s because you can use the rollers and height to your advantage, and cut the length at least in half by hanging your workpiece up. With a sit-down model, you’re limited by the table size, and you know that at least some of your project will probably spill over the edge at some point if you’re not very careful. If you’re looking at a standing model, the key thing to be aware of is the length of the stand. Longer stands accommodate wider quilts. If you work on very big pieces, you might find that a 4-roller stand is necessary to get the whole workpiece off the floor. If not, you might consider buying an aftermarket table, or seeing if the table that comes with your machine can be purchased separately. If so, it could be worthwhile to simply buy another of the same table and clamp the two together. As with most types of sewing machine these days, long-arm quilting machines are available as manual models or computerized models. Think about which one suits you best! Computerized models usually cost more, but they offer lots of convenient features. If you use a manual model, you’ll have to do all the tweaking yourself, but you won’t spend as much, and you don’t have to worry about computers getting in your way. The big difference between long-arm machines and standard home sewing machines is that these models don’t have feed dogs. They’re more like a straight-stitch or free motion sewing machine. That means that if you don’t have a computer, you’re going to be solely responsible for keeping your stitch lengths consistent. If you’re confident and experienced, that shouldn’t be too difficult. You can always start at a slow speed and then turn things up as you become more comfortable with your machine. However, if you don’t want to have that much pressure on yourself, a computerized model with a stitch regulator can be a worthwhile investment. One of these will make sure your stitches are always the same length, no matter how fast or slow you go. While computerized long-arm models don’t have all the built-in stitches and patterns that machines with feed dogs do, they can help in more ways than neatening your stitches. They can help you plan patterns and designs, or allow you to make automatic speed and stitch length adjustments. It’s all a matter of preference! Lastly, you should think about your ability (or not) to expand your long-arm machine over time. If you get an all-manual model, you’re usually stuck with it. However, many computerized machines provide accessory ports or computer/tablet connectivity. These ports will let you add things like laser sites, ruler attachments, or other helpful tools later on. If you’re a big features person, you should probably consider an expandable system. These are also excellent choices for folks who can’t make as big an investment up front, but eventually want a well-rounded workstation. Having second thoughts about whether you really want to spring for one of these machines? Don’t worry. You can check out our guide to Quilting options for more models that we suggest to quilters, or aim for one of the nicer picks on our homepage! Both the Juki and Janome from our top three are ideal quilting machines, and we offer guidance on all our recommendations to help you discern how they’ll perform for quilting. 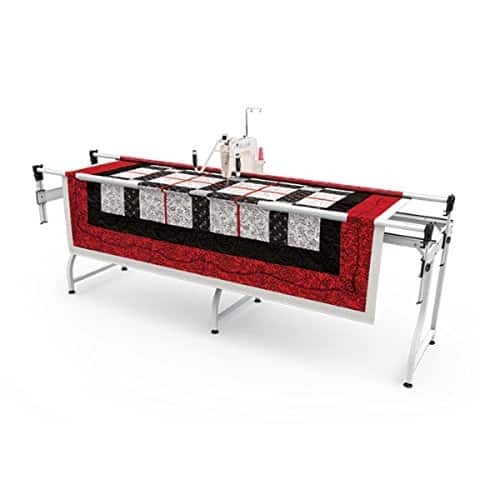 If you definitely want a long-arm machine but aren’t feeling sure about our recommendations, you might also have a look at other long-arm quilting machines from the same brands. There are plenty of models which we haven’t recommended here that you could also be happy with. The models we’ve recommended are also available in other bundles and configurations which could be more up your alley.